Low voltage-activated T-type calcium channels support essential functions both in excitable and nonexcitable cells . The molecular cloning of T-type channels has revealed the existence of three distinct channel isoforms, namely Cav3.1 , Cav3.2 , and Cav3.3 . Cav3.1 and Cav3.2 are rather ubiquitously expressed and are found in the nervous system, neuroendocrine cells, cardiovascular system, and even the reproductive system . In contrast, Cav3.3 channels are mostly expressed in the nervous system, although the presence of the channel in neuroendocrine tissues has been suggested. 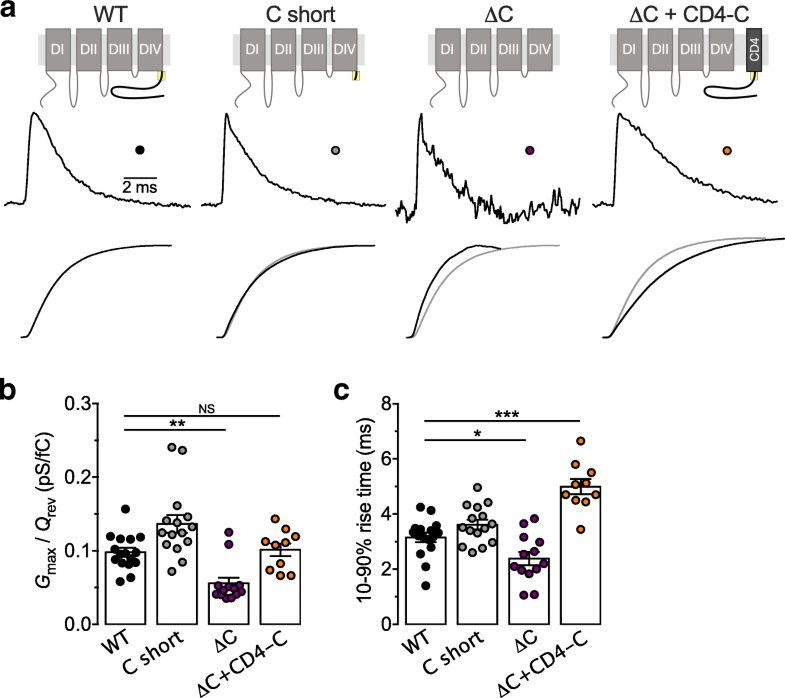 In the brain, Cav3.3 channels are highly expressed in the olfactory bulb, cortex, midbrain/diencephalon, and in the cerebellum, and to a lesser extent in the hippocampus and pons/medulla [5–7]. In addition, Cav3.3 channels were documented in rat pancreatic beta cells , human spermatogenic cells , and in interstitial cells of Cajal in rat bladder . 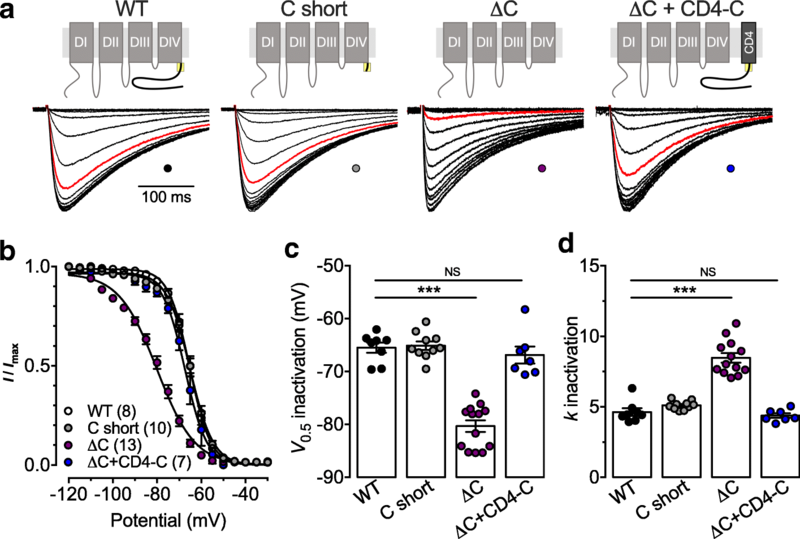 T-type channels operate at negative voltages near the resting membrane potential of nerve cells , where they contribute to neuronal excitability by generating low-threshold calcium spikes and action potential bursts  that are implicated in both normal and pathological conditions . In addition, the overlap between their voltage-dependence of activation creates a window current for calcium influx at rest, which contributes to the bistability of the membrane potential  and is essential for the generation of slow neuronal oscillations that occur during sleep . 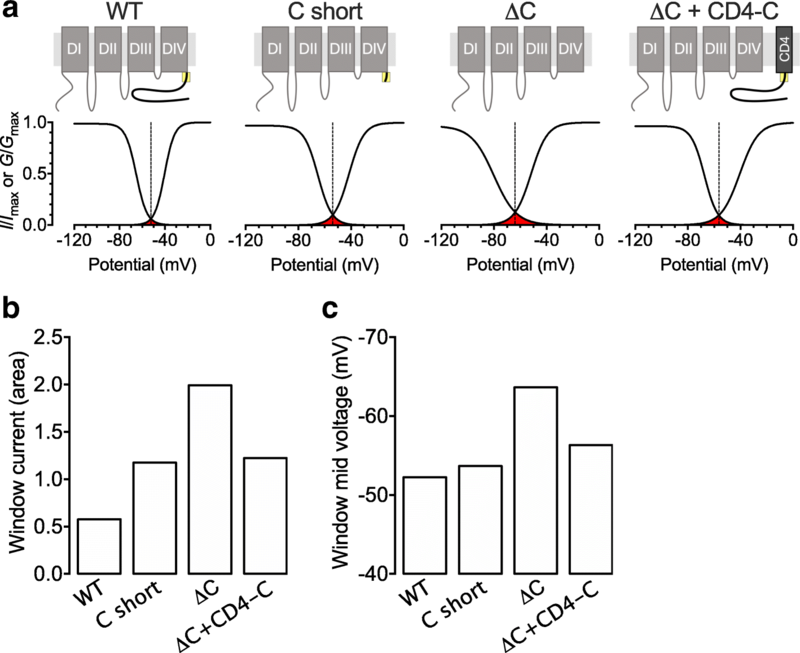 Therefore, the contribution of T-type channels in neuronal excitability relies on the specific voltage-dependent gating properties of the channels. Several studies using a chimeric approach, which consists of swapping structural regions between channel isoforms, have identified a number of regions that are important for voltage-dependent gating of T-type channels. 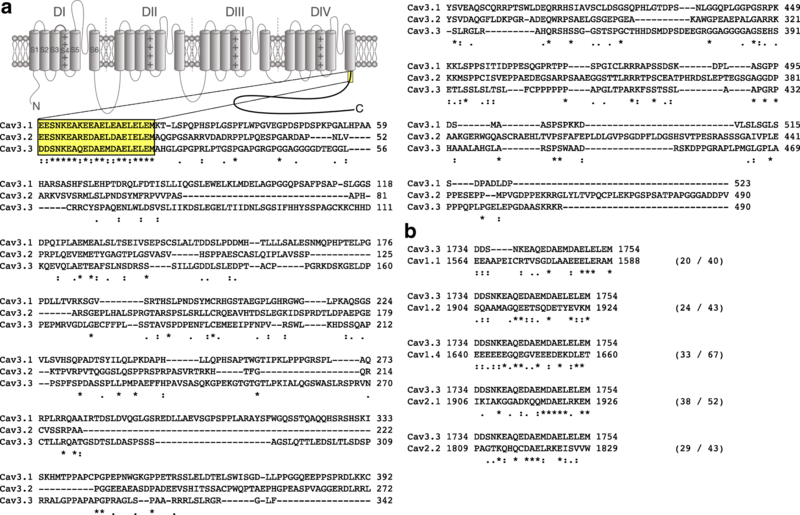 These structural determinants span across the channel protein and include the transmembrane domains I and IV, as well as several cytoplasmic regions including the I-II loop, III-IV loop, and the carboxy terminal region [15–19]. However, the chimeric approach does not allow pinpointing detailed channel structural determinants of gating, especially if these determinants are present within different channel isoforms. 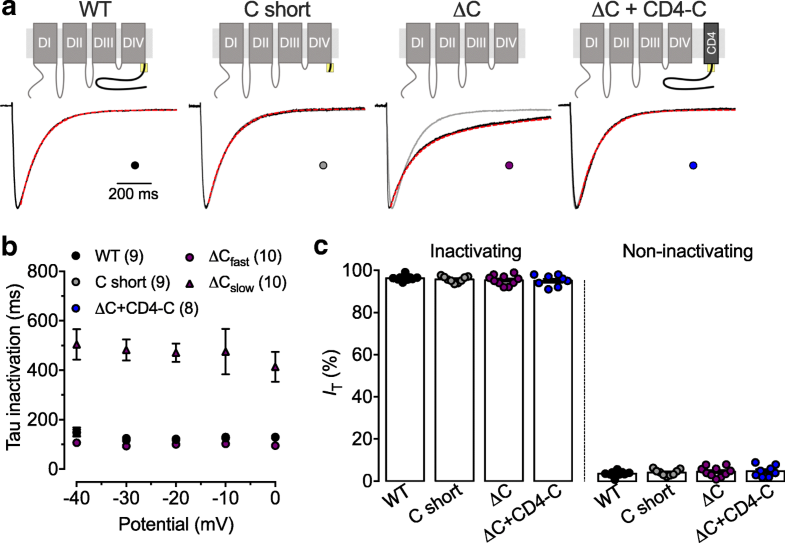 Voltage-dependent gating of T-type channels is an essential determinant of physiological functions supported by these channels. Hence, fast inactivating Cav3.1 and Cav3.2 channels support the burst-firing mode of action potentials in thalamic neurons , while the comparatively slowly inactivating Cav3.3 channels mediate pacemaker activity . Previous studies using a chimeric approach have identified several channel regions that contribute to the unique gating properties of T-type channels. For instance, Hamid and colleagues have revealed that the transmembrane domain IV region is essential for T-type channel activation, while multiple structural determinants contribute to channel inactivation . Using a similar approach, several additional studies have pointed to a role of the domain I region, and of cytoplasmic I-II and III-IV loops in T-type channel activation and inactivation properties [17–19]. Although such a chimeric approach is a powerful approach for identifying the structural determinants responsible for differences in specific gating properties between channel isoforms, it does not allow one to pinpoint detailed structural determinant of gating when these determinants are conserved within different channel isoforms. In this study, we have investigated the specific contribution of the C-terminal domain of Cav3.3 to the gating of the channel. We provide evidence that the proximal region of the C-terminus contains a stretch of 20 residues that is essential for the voltage-dependent gating of Cav3.3 channels. 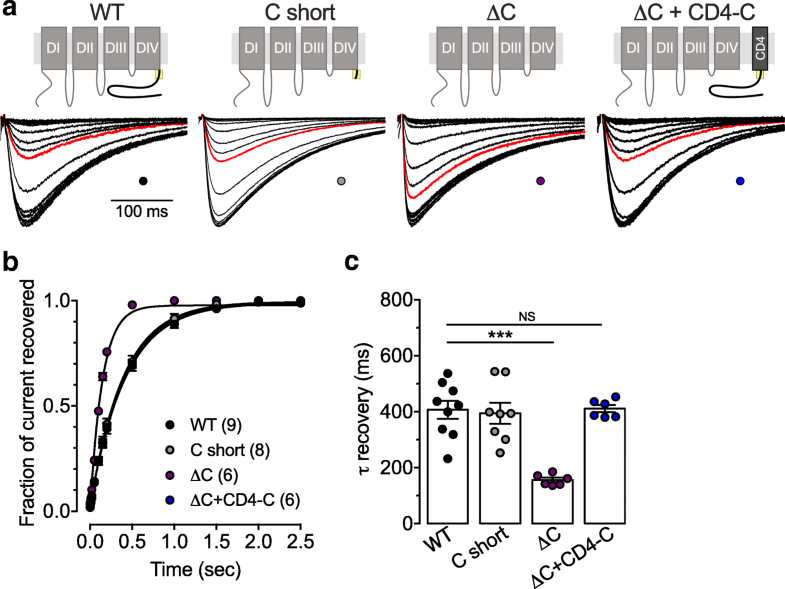 The C-terminal region of voltage-gated calcium channels is implicated in several regulatory aspects including modulation by calcium, phosphorylation, and synaptic proteins [23–26]. 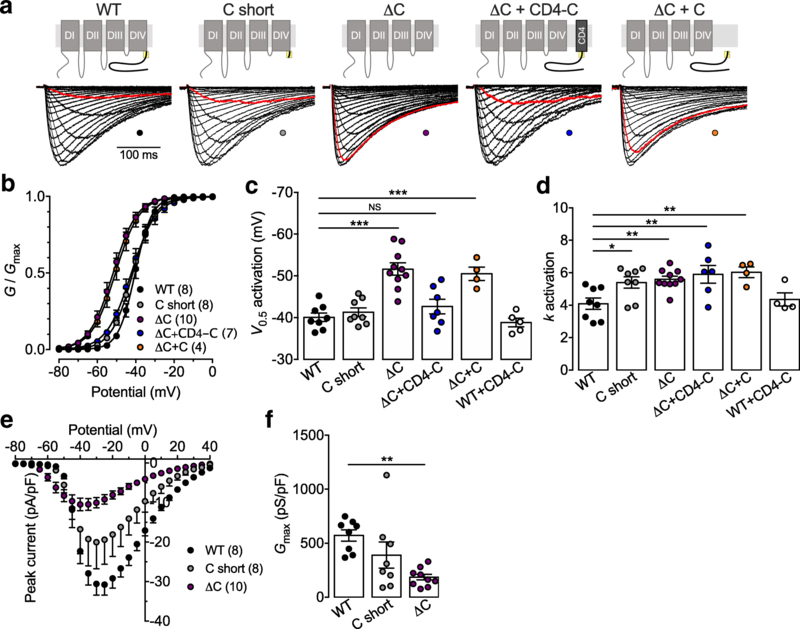 Here, we demonstrate that the C-terminus of Cav3.3 is an essential structural determinant that contributes to several gating aspects of the channel. We show that deletion of the entire C-terminus (Cav3.3 ΔC), leads to a dramatic shift of the voltage-dependences of activation and inaction of the channel towards more hyperpolarized potentials. In addition, we observed several alterations in the kinetics of the channel including reduced channel inactivation and faster recovery from inactivation. Finally, recordings of gating charge movement revealed a decreased coupling between the voltage sensing and pore opening of the channel. Although these alterations could have resulted from a nonspecific alteration of the channel protein, our observation that most of the gating properties were fully restored upon coexpression of a membrane anchored fusion protein containing the C-terminus of Cav3.2 channel indicates that alteration of Cav3.3 gating is an intrinsic consequence of the deletion of C-terminal region rather than a nonspecific misfolding of the channel. In addition, the Cav3.3 C short deletion channel (where the entire C-terminus except for the first 20 proximal amino acids) retained gating properties that were undistinguishable from the full-length channel. This suggests that alteration of Cav3.3 gating upon deletion of the C-terminus is essentially mediated by the absence of this proximal structural determinant. This notion is further supported by the observation that despite the fact that the C-terminus of Cav3.2 presents a very low degree of homology with the C-terminus of Cav3.3 (14% identity and 23% similarity) and is only highly homologue for the first 21 amino acids (76% identity and 90% similarity), it was sufficient to rescue the gating of Cav3.3 ΔC, further excluding the implication of downstream structural determinants.